Red Shadows Secret Base 2010 - Joecon Exclusive playset - Page 2- BLOOD FOR THE BARON!!! jamarmiller wrote: you bet they are! these sell out and they will be DOUBLY open for suggestions! Look at it this way TK they didn't sell too well at the con but they certainly will after the con by us fans who couldn't attend. agreed its the best thing, but the sets never sell out at the con ( except the very first one ) and all past years toys are still for sale in the store, so if this sells out ,,,,,,,,,,,,maybe they will ? or maybe Hasbro will take notice and produce some ( which they have done before when they saw the success of the crismon strike team from the first year ) and if Hasbro Does it, then it will be cheaper! also I do want to add that the over all response to most of this stuff has been much better than past years. sorry didnt make myself quite so clear - wasnt referring to the actual set as up until recently they had the dreadnok set for sale which is pretty old but meant the attendee exclusives. Ive never known so many in both qty and variety to be available after the con, basically everything was available except the z bike which was only produced in smaller numbers. your probably right, LOL but I can hope ! and actually, if we never get any more stuff from the club or Hasbro, I still feel really lucky, happy, content, and like we accomplished what we set out to do 5 years ago. jamarmiller wrote: your probably right, LOL but I can hope ! Yep, the staff car and the Red Shadows T-Shirt are the only Items I know of that sold out at the con. Now here's something to ponder over. Is the reason the exclusives didn't sell out due to the characters or the toy parts they used? My example being the T-Shirt. 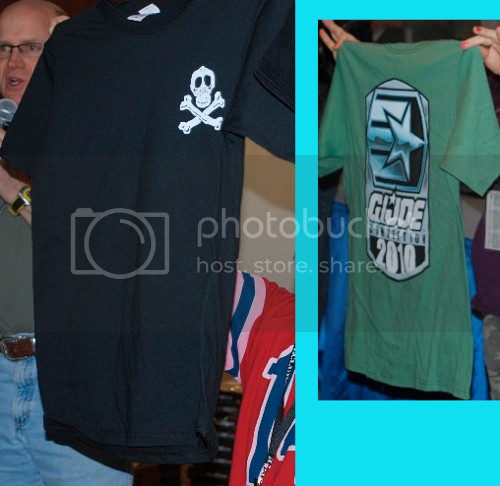 There were two different con shirts this year, a black Red Shadows one and a green Adventure Team one. The club made more AT shirts than Shad shirts because apparently they can't make an even number of shirts for both versions. (seriously, they told me they always make more of one shirt than the other one) Now if the shirts were selling out because they were con shirts I would assume there would be more AT shirts sold, but from what I understand the Shad shirts lasted a very short time. People in line on Thursday night for Pre-Registration couldn't get them because they were already sold out. And while at the con, I saw at least 5 Shad shirts being worn for every one AT shirt on someone's back. that is interesting, hmmmm makes you wonder, had they used 25th figures to do the Red Shadows would hey have sold out? or the same? thanks for that interesting bit of info there Shogi. its really good to know lots of people were wearing the RED SHADOWS shirt, I bet thats something Hasbro couldnt ignore! RED SHADOWS T-SHIRTS?? WHAT?? WHERE?? WHEN?? The Baron wrote: RED SHADOWS T-SHIRTS?? WHAT?? WHERE?? WHEN?? You and me both! I went to the con and couldn't even get the shirt.